I had decided on putting the Christmas tree up and decorating the house this coming weekend. It didn’t actually happen like that, we actually put the tree up this last weekend and now have Christmas bits and bobs all over the place… I even have random bits of tinsel hanging from my ceiling! Really, I am just the person who decides where the tree goes, it is actually Mini Me who is the chief decorator, which possibly explains random items dangling from my ceiling! It was great to see that so many of our Baker Ross Christmas decorations that we made last year had survived living in the garage for a year, proudly taking their places on the tree… making sure there was room for this year’s new crafty additions! 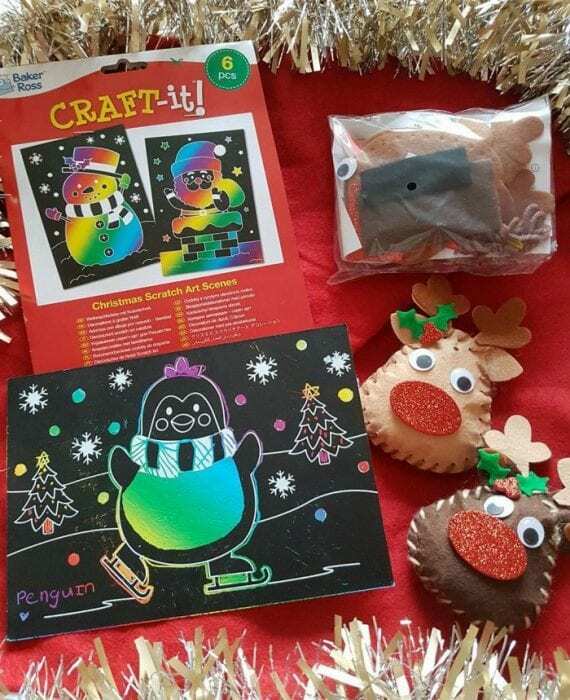 We have been adding to our Christmas crafts recently after the our new Baker Ross box arrived to lots of squeals. Admittedly, it is my favourite box of crafts that we receive during the year too… it somehow makes Christmas seem more real and ensures we have lots of fun in the run down to the big day! This Christmas we having been crafting with Baker Ross Christmas Elf Mix and Match Decorations (£3.49 for a pack of 6), Gingerbread House Photo Frame Kits (£1.49 for a pack of 5), Christmas Bauble Colour-in Window Decorations (£2.75 for a pack of 12)… which Mini Me decided to colour in with felt tips on a box of Celebrations! Baker Ross currently have 20% off their Christmas range if you use the code R650C.